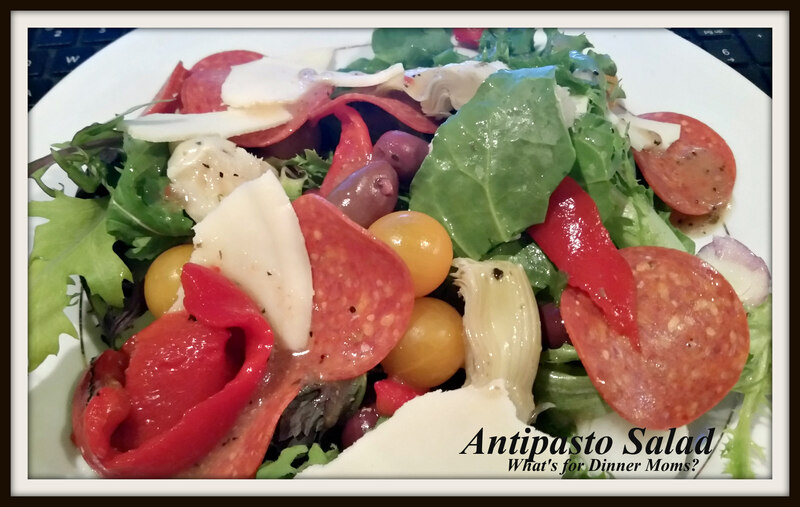 Antipasto Salad – What's for Dinner Moms? We started our Community Shared Agriculture (CSA) share last week. We are getting mostly greens, herbs, and some berries right now but there are some radishes, green onions, and carrots. We have been making lots of salads with our share. We love antipasto salads with roasted red peppers, kalamata olives, artichoke hearts, salami or pepperoni and provolone cheese. All the wonderful flavors together that we love. I had to look up if it was antipasto or antipasti. Antipasto is the singular form of the dish that you would have as a first course. We all love a salad bar especially when it has all of our favorites on it. Plus with the 90 degree temperatures the last few days no one has really wanted to cook. We added a fresh loaf of Italian bread to sop up all the leftover salad dressing and oils from the roasted red peppers and artichoke hearts. Yummy! The Italian bread for sopping up leftover dressing is the best part! I love salad and this sounds great. I just wish I could grow some of my own vegetables here. We have a small garden in pots on our deck – mostly herbs and some tomatoes but it is slowly growing. Most of our produce is from a local farm. Pingback: The Purple Almond: Food to heal the body, mind and soul Thankful Thursday: Slow Cooker Garlic Parmesan Chicken and Potatoes – What’s for Dinner Moms?